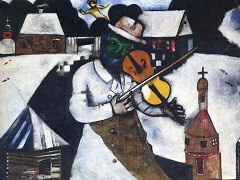 The Green Violinist was painted by Marc chagall in 1923-1924. It is a merry celebration of the tension between change and continuity, or the material and spiritual elements of our lives. The painting itself is enjoyable. 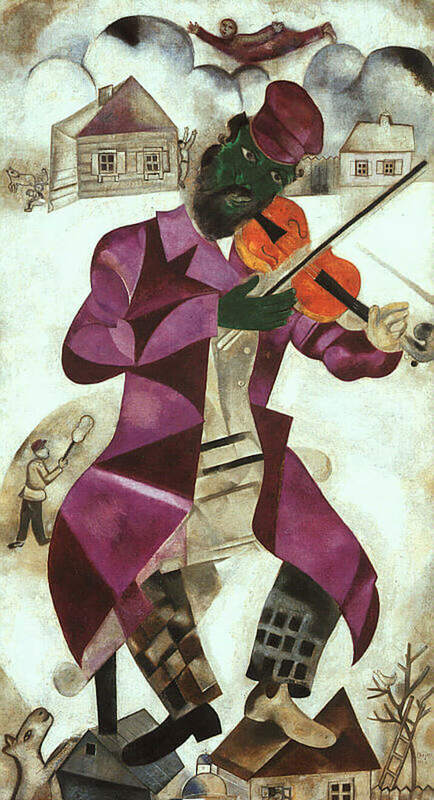 Set against a bland backdrop of grey, brown, and black, a geometrically-inspired man in vibrant secondary colors (purple, orange, and green) plays a violin while standing on top of two houses. Or perhaps he is floating above them even like the man at the top is floating like a kite? At any rate, the man is green - really green! One hand is bare and the other is gloved. And check out that purple coat with triangle patterns! 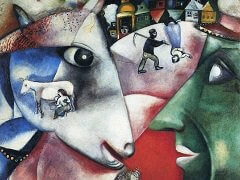 Imagine the historical changes that took place in Chagall's hometown of Vitebsk. 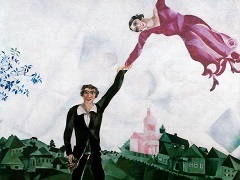 When Chagall was born, the town was under Tsarist rule. The Communist revolution brought political change and much turmoil. The Nazis took over the town for over three years, during which time 150,000 Jews died. Then, the Soviet Union took over the area and ruled until 1991. Now the city is part of the nation of Belarus. There is real tension between the forces that pull us forward and those that keep us in the past. However, even the phrase "keep us in the past" is a phrase that seems either negative or positive depending on your perspective. 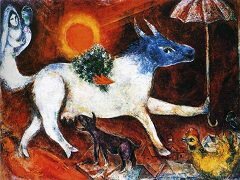 In the modern times we live in, being "kept in the past" would seem to be a negative thing in light of the promised land of potentiality and change and transformation. 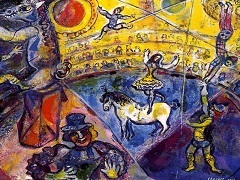 The fiddler stands for joyful tradition, even while playing out to people leaving the village (horse and cart at top right) and finding freedom elsewhere (man floating off the page at top). The drumbeat of change will not stay outside of this man's town, and yet the dog reminds us of fidelity to some part of the past. The ladder is at once both bound and free, one end on the ground and the other in the air. 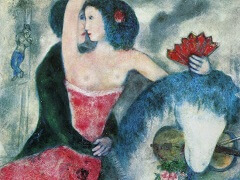 The tree itself is barren, but the bird in the branch reminds us of Chagall's use of birds as a symbol of freedom.